Powder coated aluminum and 304 stainless. IP 66 rating (dust tight and protected from strong jets of water), powers up to a 24" arm and blade combination (36" total length). 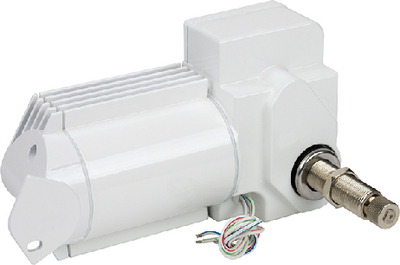 Two-speed, self-parking heavy-duty motors for exterior/unprotected locations have a three year warranty. Sweep angle is preset at 80° or 110°, but can be reset at 40°, 50°, 60°, 70°, 90°, or 110°. Powder coated all aluminum housing with stainless steel mounting bracket, shaft, and knurled fitting. All motors are preset for left-hand side park. Available in white only. CE approved.